We all focus so much on careers, making more money, getting that next promotion and we really tend to forget about the important role that health can play in or lives. As we are working harder for the next promotion, working longer hours and other things, those things may take a toll on our health whether we know it or not. We can tend to lose track of the importance of maintaing awareness about heath and wellness as we are working hard chasing the dream. 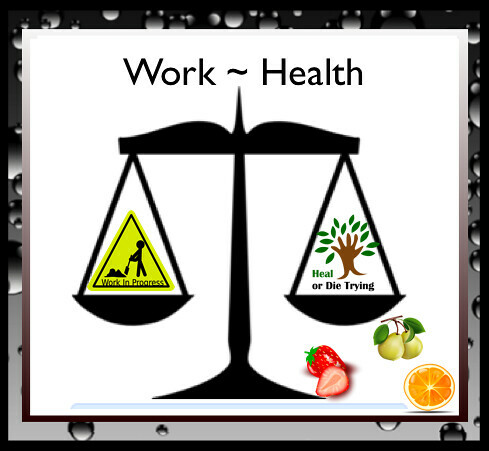 A huge part of health and wellness is the ability to find a work and health balance. Traditional corporate, high power and high stress jobs can take a toll on ones health. We all have to make a consious effort to balance work and heath, I would say that it is a matter of life and death because work stress has been show to cause a variety of illnesses. Work and Health balance are things that an employer would never address as it is usually not a concern to them. Some employers primary goal is to focus on what you can best do for their organization NOT how doing so may effect your heath and well being. However, it is your job as an individual to be in touch with what’s good for you and this includes creating a life that has a balance of heath and work. Eat Healthy Foods: This sounds very simple but it is not always a simple thing to do. When I worked for Corporate America, there were times when I did not take time to eat properly due to obligations to meet deadlines and such. This is NOT a good practice. After leaving Corporate America, I have since developed much healthier habits, my health has improved substantially and I have gone down 2 sizes without even trying. I was not trying to lose any weight, I do not know much I’ve lost but I do know that my eating habits have improved and I feel so much better. Pack a Healthy Lunch & Snack: If you have healthy foods on hand it will be that much easier to eat healthier. Taking Time Off: This may be a hard thing depending on what industry you are involved with. However downtime is essential, even if its for a few days. Unplug: This is especially hard for me as what I do is Internet related. I’ve found that making a conscious choice to leave my laptop in my home office helps. We are such a plugged in society now so it is imperative that we take downtime from computer activities. Get Some Sleep Already: This is a HUGE challenge to me because my sleep habits are horrible. However when I make an effort to get sleep I feel so much better. I keep telling myself that sleep is good. These are some simple things that can move you closer to a more balanced life. You will be surprised at how easy it is to do these few things and how much better you will feel.